Classical sites in Athens, including the Acropolis complex and the Parthenon, the Agora and the later Roman Forum, and the twisting back streets of the Plaka district. Hop on a ferry to the Greek islands and see Santorini, Mykonos, Ios, Paros, Patmos, Rhodes, Samos, or any other of the many islands. See the truly ancient sites of the citadel of Mycenae and Tiryns, dating back to the Trojan War. Visit the wonderful temple complex of Delphi. See the monasteries of Meteora, perched on top of rock towers. The Temple of Poseidon at Cape Sounion overlooks the Saronic Gulf southeast of Athens. The best time to visit Greece are the "shoulder seasons", from late April until things get crazy in mid-June, and again starting in September until maybe the middle of October. The "low season" then runs from late October through the middle of April, and many places are closed and the inter-island ferries run much less frequently. The "high season" for travel in Greece runs from the middle of June through August. Things get busy, hotels and ferries fill up, so plan ahead for a visit during that time. The various Lonely Planet titles are useful for planning your trip and for logistics. How to get to a place, how long the transportation will take to get you there, and maps showing just how to find the specific things you want to see and do. Lonely Planet has shifted its target audience. It used to be aimed at the budget traveler. Now there is still some budget information in there, but the majority of their suggestions for accommodations are mid-range and up. The trick is to use an older edition to find your accommodations. Use the current or at least a recent edition to plan your trip, to make sure you know what is available to see and how to get there. Then also buy something like the 2006 Greece or the 2006 Greek Islands title used through Amazon. They will be almost free beyond the shipping cost, and they will have much more useful suggestions about budget places to stay. You might be able to find older editions at the library. Now that you know what you're looking for, you can track down the budget places on line and contact them directly. Get the Blue Guide for the whole country or your region of interest for excellent detailed descriptions. It will have detailed diagrams of sites and deep background information so you can understand and appreciate what you're seeing. The Michelin Green Guide is also an excellent reference for details. Greece is pretty easy to get around. 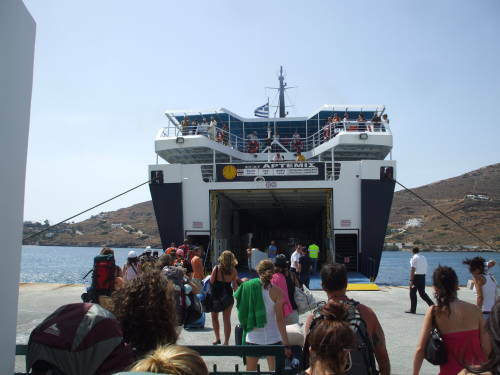 Ferries around the Aegean are frequent, fast, and inexpensive. You need a little patience with the land transportation, as the buses and trains can be infrequent and slow. Be aware that the two bus stations in Athens are inconveniently located. The bus lines are not luxurious, but then you usually are not travelling too far. 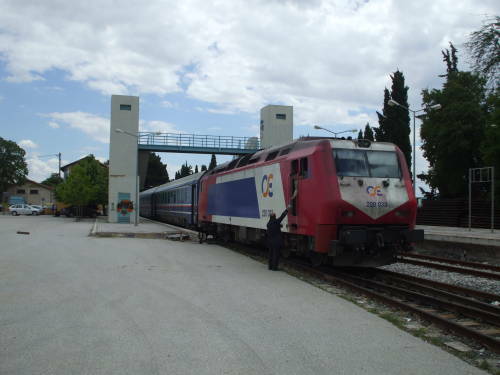 The trains are much more comfortable, if you're going somewhere they reach (e.g., Corinthos, or Olympia, but not Delphi). Have some flexibility in your travel plans, especially around Athens. Strikes frequently halt the various forms of transportation: bus, train, Metro and commuter rail, and taxis. You may need to find an alternative mode of transportation, and if most all are halted, simply wait a day or two. Greece may have been the birthplace of democracy, but it is the retirement home of European communism. Not mild socialism, but full hammer-and-sickle-waving communism. 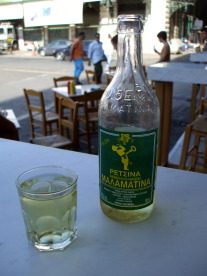 Drink some retsina or Ρετσινα, while you're in Greece. Yeah, it's a little like wine with turpentine, but not too much so. 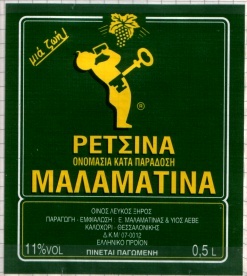 Retsina's unique flavor comes from an early practice of sealing wine amphorae with pine resin to prevent oxygen from reaching the wine and ruining it. Pliny the Elder wrote about retsina in his Natural History (14.124) recommending that resin be added to the fermenting must used to produce wine. It is not too difficult to deal with the language. Really. You will have an advantage if you happen to know any Russian or other East Slavic languages, as Saints Methodius and Cyril devised the Cyrillic alphabet using Greek as much as possible in the cases of similar sounds. Apparently Methodius did most of the work but Cyril got the credit, hence the alphabet's name "Cyrillic" and not "Methodical". Here's the alphabet — the capital and lower case Greek, the letter's name, and the very approximate English (and NATO and Old English and Scottish and French) equivalent. If you just see boxes or gibberish, use a better browser that understands Unicode. Α α Alpha A as in "father"
Β β Beta V as in "Victor"
Γ γ Gamma G as in "goat"
Δ δ Delta Ð as in "there"
Ε ε Epsilon E as in "get"
Ζ ζ Zeta Z as in "Zulu"
Η η Eta I as in "feet"
Θ θ Theta Þ as in "thick"
Ι ι Iota I as in "feet"
Κ κ Kappa K as in "Kilo"
Λ λ Lambda L as in "Lima"
Μ μ Mu M as in "Mike"
Ν ν Nu N as in "November"
Ξ ξ Xi X as in "ox"
Ο ο Omicron O as in "hOt"
Π π Pi P as in "Papa"
Ρ ρ Rho R as in "Romeo"
Σ ς, σ Sigma S as in "Sierra"
Τ τ Tau T as in "Tango"
Υ υ Upsilon I as in "feet"
Φ φ Phi F as in "Foxtrot"
Χ χ Chi CH as in "loch"
Ψ ψ Psi PS as in "lapse"
Ω ω Omega O as in "note"
αι ai as in "aisle"
ει ee as in "feet"
ηι ee as in "feet"
οι ee as in "feet"
ου oo as in "food"
υι ee as in "feet"
Because of a process called ἰωτακισμός or iotacism, many vowels and diphthongs in Ancient Greek converged so that in Modern Greek η, υ, ει, ηι, οι, and υι are all pronounced the same as ι. 7000 BC The Neolithic Revolution arrived from Anatolia. This was the revolutionary development of agriculture and an associated transition from hunting and gathering tribes to settlement and the establishment of communities and labor specialization. 2700 BC The Neolithic era ended with the arrival of metallurgy from Anatolia and the Near East, and the Bronze Age began in Greece. 3300 — 2000 BC Cycladic civilization on Aegean islands such as Delos, Ios, Mykonos, Naxos, Paros, Thera and others. The Cycladic civilization merged later with Minoan culture. 2800 — 1060 BC Helladic period on the Greek mainland. 2700 — 1450 BC Minoan civilization on Crete, apparently ended by the explosion of Thera around 1450 BC. 1900 BC The Mycenaeans, Proto-Indo-Europeans, invaded the Greek peninsula from the north and east. 1100 — 800 BC The Greek Dark Ages, starting with the Dorian invasion and the end of the Mycenaean culture. The Dorians showed up with iron weapons, and the Iron Age defeated and replaced the Bronze Age. 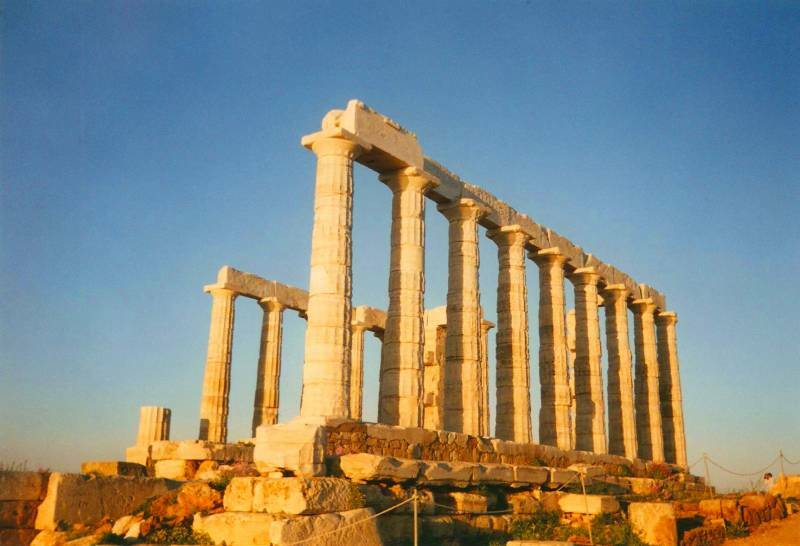 1000 — 323 BC Ancient Greece, considered to be the foundational culture of Western Civilization. Delphi was a major religious center from 1600 BC to 395 AD. Socrates lived from about 469-470 to 399 BC, his student Plato from about 428-427 to 348-347 BC, and Plato's student Aristotle from 384 to 322 BC. Aristotle was the teacher of Alexander the Great, who lived from 356 to 323 BC. 510 — 323 BC Classical Greece — wars with the Persians, wars between Greek city-states, and eventually the arrival of Alexander the Great. See Athens and Corinth. 323 — 146 BC Hellenistic Greece — the importance of "Greece proper", roughly the territory of the modern country, decreased as Greek culture shifted to Alexandria in Ptolemaic Egypt and Antioch in Seleucid Syria. Rome annexed the Greek peninsula and the islands in 146 BC. 168 BC — 300s AD Roman Greece — Greek culture controlled and administered by Romans, at least initially. Rome continued to fade and Roman Greece became more Greek again. 300s — 1453 AD Byzantine Empire — Constantine the Great made Constantinople the capital of the Roman Empire. Rome itself quickly faded away. The monastic community of Meteora was established in the 800s, with the large monasteries built in the 1300s. 1204 — 1261 The Fourth Crusade in 1204 was an awful episode, even by the standards of the Crusades. The western Europeans found Constantinople to be a much more attractive target than the Holy Land, and there was a Latin empire for 57 years. In 1261 the Greek empire was divided between former Byzantine dynasty members, leaving it weak and susceptible to Ottoman conquest in 1453. 1453 — 1821 Ottoman rule. 1821 — Modern Greek state. How do you use a Greek toilet?